Mrs. Louise Oriole Burevitch of Wilmington died in September 2014, leaving a fortune that few suspected she had. The bulk of her estate was earmarked for charitable purposes, including $20 million for an endowment that will be administered by the North Carolina Community Foundation. Jenkins had worked with “Mrs. B,” as friends called her, on philanthropic matters during her later years. Her contributions were many, generous and varied – but with some common themes: animal welfare, education, healthcare and issues related to women and children. Jenkins’ professional relationship with Mrs. B gradually became a friendship, which was the hallmark of many who worked with her over the years. “She was just a fun person to be around,” said Jennifer Casey, a First Citizens Bank senior vice president and fiduciary advisor who handled the majority of her financial affairs and also became a good friend. Mrs. B’s generous nature, concern for the welfare of people and animals and tax considerations provided the initial impetus for her charitable giving. “At one point she realized that she would be giving a substantial amount to the federal government if she didn’t make some charitable contributions,” Casey said. Mrs. B began to research causes and organizations that could benefit from her largesse. Her love of animals, and especially dogs, made it easy to pinpoint one major category of her charitable giving. Having no children or close relatives, Mrs. B’s pets were like family, some even named in her obituary. She forged deep friendships with her animals’ caregivers, especially Dr. Jeff Dineen, a local veterinarian. Mrs. B loved “her critters,” said Dineen. “And she also loved people.” He described regular visits with him and his staff, who also grew quite fond of her. In later years when she couldn’t walk well, she would pull into the parking lot around lunch time when the office was quiet, just to check on him and the staff. Everyone would go outside to greet her and chat curbside. Her interests in sea creatures informed a generous gift to the University of North Carolina at Wilmington, where Mrs. B provided funding for a variety of programs and the construction of a building that houses a lab for the study of marine mammals. Beau Cummings, UNC-W’s director of development for major gifts, described her as “an unforgettable person.” The two became such close friends that Cummings served as a pall bearer at her funeral. Another friend who started out as a professional acquaintance was Margaret Robison, vice president for institutional advancement at Cape Fear Community College and executive director of its foundation. Mrs. B donated funds for a nursing lab at Cape Fear, as well as the lobby that will be named after Jake when the community college’s new vet-tech clinic is constructed. Most of Mrs. B’s wealth resulted from her first marriage to Arthur Oriole, whom many have called the “love of her life.” A New York stock broker who did extremely well, he died tragically at home of heart failure in his 40s. “She never really got over that loss,” Casey said (although she later wed William Robert Burevitch, who also predeceased her). As the story goes, “Artie” Oriole was smitten the first time he laid eyes on the former Nell Louise Johnson during a Wrightsville Beach stopover while motoring from New York to Florida. “He told friends he had never seen a more beautiful girl,” Casey said. He offered to drive her from the beach to her home in Wilmington in his red convertible, something she desperately wanted to be seen in around town. She called her mother to seek permission, which was granted, much to everyone’s surprise! They began a long-distance relationship by mail. A year later, he returned to Wilmington and proposed. They married in New York, where they lived and were happy and active, enjoying the city’s night life, Broadway theater and travel throughout the United States and world. Mrs. B had a life-long interest in fashion, even making her own wedding dress. “She always had her hair and nails done and loved pretty clothes and shopping,” Casey said. 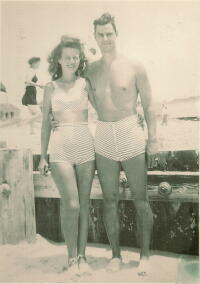 One of Mrs. B’s favorite photographs was of her and Artie standing on a pier in matching bathing suits that she had designed and sewed for them. The old photograph depicts a svelte, beautiful couple who could have easily been cast in movies of the time. As Mrs. B became more knowledgeable about charitable giving, she even briefly considered establishing her own private foundation. She discarded the idea when she learned about the regulatory red tape and realized there would be no one to manage an independent organization when she was gone. She ultimately decided that a donor advised fund would provide the flexibility, support and tax advantages she needed. It was around this time that she established an endowment with the North Carolina Community Foundation to serve as a “place keeper” for her legacy giving, Jenkins said. Jenkins noted the benefit of “a team approach” shared by John Sloan, Mrs. B’s attorney at Ward & Smith; Casey at First Citizens; and NCCF that helped Mrs. B define and implement a planned giving strategy that achieved her goals and potential as a philanthropist. Mrs. B provides another example of NCCF coming together with professional advisors to help people realize their legacies through planned giving. “While most people don’t have $20 million to support their charitable interests after they’re gone, Mrs. B’s story is a dramatic example of the value of learning how to preserve and direct your wealth, at any level, so it can fuel your philanthropic passions for generations to come,” Jenkins said. Mrs. Burevitch’s generosity is continuing through grants disbursed this year to her preferred charities, as she requested. It is anticipated that the first discretionary grants process may be opened by 2018. Please continue to visit this website for additional updates!